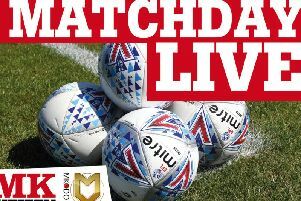 A late Russell Martin goal with four minutes to go handed MK Dons a vital 2-1 victory over Forest Green Rovers at The New Lawn on Saturday. In a tight battle from start to finish, Kieran Agard opened the scoring when Gavin Gunning's error allowed David Wheeler to pick out the striker for his 21st of the season on 37 minutes. Former Dons academy product George Williams was a bright spark for the home side throughout, and headed Rovers level on 62 minutes but three changes from Paul Tisdale changed the game. And as Dons piled forwards late on, Russell Martin was on hand at the far post to turn home Jake Hesketh's cross to win it with four minutes to go. Bury's surprising 3-1 humbling at home to Swindon means Dons climb into second spot in the table with six games remaining. After picking up a knock against Yeovil last week, Alex Gilbey was unable to shake off his ankle injury and was the only change to Paul Tisdale's side for the trip to The New Lawn, with Conor McGrandles replacing him in the centre of midfield. With both sides seemingly happy to feel each other out in the opening 25 minutes, the game sparked into life when Dons won a string of corners, but a poor ball from Dean Lewington sparked a Forest Green counter, which saw Joseph Mills come closest to opening the scoring as he fired into the side netting. Until that point, Dons had looked comfortable in possession, playing nice passing football before looking for a killer pass to undo the home defences. At the other end though, Forest Green laid claim to the better chances, with Christian Doidge twice making Lee Nicholls work to no avail. With so much at stake in the promotion race, Dons were handed a huge slice of good fortune 11 minutes before half time when Gavin Dunning was dispossessed cheaply in the corner by David Wheeler, and with the rest of the team up field, Kieran Agard was left all alone in the box to tap home. He should have put the game to bed five minutes after the restart when he was put through one-on-one with keeper Lewis Ward, but his left-footed effort was fired wide. Given the home side's position in the table, they were always going to find a way to create chances and their equaliser, coming on 62 minutes was as straight forward as they come, with George Williams heading home Liam Shephard's cross from the right flank to draw them level. The introduction of Chuks Aneke with 20 minutes remaining gave the game an added feisty, more physical edge, especially when Ouss Cisse and Robbie Simpson joined him six minutes later. Dons should have wrapped it up with eight minutes to go when Aneke's fine hold-up play brought Callum Brittain in to fire, but after a couple of deflections it made it's way to McGrandles who should have scored at the near post but fired into the side netting. But with four minutes to go, Dons retook the lead, and with it second spot in League 2, when Russell Martin, who stayed in the penalty area for a corner, found space at the far post to fire past Ward.